Featherlite Coaches builds the luxurious Vantare’ luxury coach on the Prevost bus conversion motorhome because of the longevity and safety systems built into the chassis. -Prevost Structure/Beam: The integrated chassis and the Prevost Beam construction provide a holistic structure that is remarkably strong and durable. Not only does this robust architecture contribute to the passive safety qualities of the motorhome, but its inherent torsional rigidity enables levels of handling precision and vehicle responsiveness that enhance dynamic safety as well. -Electronic Stability Program (ESP): The Prevost Electronic Stability Program (ESP) automatically compares the driver’s intentions with actual vehicle movement hundreds of times per second. 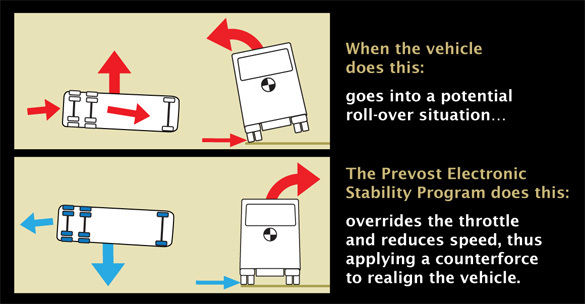 ESP continuously monitors wheel speed, steering angle, lateral acceleration and yaw, and then – as needed – can apply individual wheel’s brakes instantaneously to help maintain vehicle control and reduce the risk of rollover. This remarkable safety advance also helps provide significantly improved stability in the event of evasive maneuvers, sudden lane changes, and obstacle avoidance. -Anti-Lock Braking System (ABS) and Engine Braking System: The ABS Braking System is sized and calibrated to provide the safest, shortest stopping distance, regardless of the motorhome’s speed, and across a wide range of road and weather conditions. 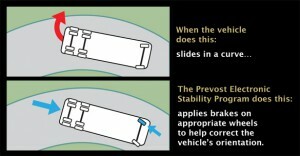 The optional Engine Braking System adds an additional measure of braking capacity. -Tire Pressure Monitoring System: Prevost’s Tire Pressure Monitoring System helps ensure optimal vehicle capabilities by providing continuous real-time measurement. The system samples both temperature and pressure, and helps detect inner drive-tire failures that can be missed during visual inspections. It also contributes to improved fuel economy by helping operators keep tires at their optimal pressures. An easy-to-read, integrated dashboard display makes the system extremely easy to use. Within a minute after engine startup, the driver is provided essential tire information. This fully self-contained system requires no programming or activation tools. -Fire Suppression System: The Prevost Fire Detection and Suppression System is the most complete system on the market today. Linear thermal and optical infrared detectors improve passenger safety by protecting the engine compartment and auxiliary heater. The system also provides audible and visual warnings to the driver in case of an incident. -High-efficiency Projector Headlights: The most powerful lighting system ever offered by Prevost, these high-efficiency projector-beam lamps feature special lenses that broaden the range of vision from left to right, which means better visibility in rain or fog. Polycarbonate lenses offer increased resistance to the impact of stones and other road debris. LED directional signals provide a high degree contrast, so driver intentions are always clear, even when the high beams are on. The optional Xenon-gas headlights are five times brighter, last six times longer, and consume half the energy of traditional halogen lamps. An optional headlamp cleaning system uses a single jet of liquid to remove accumulated grime from headlights, thus enhancing visibility, safety and peace of mind in harsh weather environments. Headlight maintenance is also easier than ever. Headlight clusters are hinged for easy bulb replacement and aim adjustment. In fact, no tools are needed to change bulbs, and high and low beams can be adjusted with a single universal screw control.